My mom has taught me many valuable lessons over the years. Always bring a good book. Being sick/tired/cold is a state of mind. Do the crossword puzzle with a pen. And it’s perfectly okay to eat a plate of potatoes for dinner. I refuse to give in to potato-bashing. You’ve heard it: too many carbs, makes you gain weight, barely any nutritional value. Most of these issues stem from what we put on them (cheese, sour cream) or how we prepare them (deep-fried). But potatoes are nutrient dense – they pack a good nutritional punch for the amount of calories they have. Vitamin C, Vitamin B6, fiber (both soluble and insoluble), iron, potassium, flavanoids… Humble, sometimes dirty (think B12!) and yes, unattractive, they are also versatile, tasty, satisfying, filling, easy to digest and they are perhaps the most tolerant of foods – absorbing, assuming and refining all flavors that come their way. The potato welcomes all comers, from broccoli, beans, and sauteed mushrooms to marinara sauce, plain ol’ catsup or a tangy, garlicky vinaigrette. Mash, cube, slice, or bake whole – it never complains. No offering of salads would be complete without including the glorious spud. We ate this flavorful mess as a main dish over steamed baby spinach, but it makes a delicious side dish, too – and it travels well. Place potatoes in large pot, cover with water and bring to a boil. Reduce heat to a simmer and cook for about 15 minutes, or until potatoes are tender. Drain and let cool slightly before cutting into chunks and placing in a large bowl. Add the white wine vinegar, lemon zest, salt and pepper, parsley, cherry tomatoes and capers. Set aside. In a food processor, combine the dressing ingredients and process until mostly smooth. Pour the dressing over the potatoes and gently toss to combine. Serve. Capers have been popping up everywhere this spring – I’m so excited! They add so much flavor and I bet they would really liven up this potato salad! I love capers and am always looking for ways to use them. Wow! That’s gorgeous! I’m always looking for ways to revamp the old classic tater salad and make it something new and delicious! I love your take on the recipe! This looks so delicious. Yummy! This is so good as I always end up making the same salads, thanks. A pepper thief, eh?? Sounds as if you need to get creative and sneaky! I am obsessed with colored potatoes right now. This meal looks AMAZING! I’m with you, potatoes are so good. This salad looks beautiful, both for its flavors and it’s colors. I love your “Seven Days of Salad” idea! This one looks delicious, warming and filling. Makes me hungry! I’ve never liked traditional potato salad. This looks like one I could like! No mayo; I have nothing against mayonnaise, I just don’t like it on potatoes. I’m with you – never did like a mayo-based potato salad. Same with mayo coleslaw. Yay for potatoes! I always cringe a little inside when someone starts potato-bashing. I’d rather be potato mashing (I am so, so, so sorry for that horrible joke. I was committed to it and had to follow through…)! hehe! I’m all about silly jokes ;-)! I’m a huge fan of savory salads! Olives, capers, garlic, salt & pepper = YUM! The potatoes made it even more special. Thanks for this, I’ll try soon. I have never eaten a potato salad before, but I’m definitely going to try this recipe ! Thanks ! The colours in this one are amazing. Love the combination of sundried tomatoes, olives and capers. This is not your mother’s potato salad — at least not my mother’s! I know, right? My mom made a very mayo heavy potato salad and I just never liked it, even though I liked mayo. Something about the mayo w/ the potatoes just didn’t work for me. I just like some tang w/ potatoes, I guess! This just made my mouth water – will have to try it! 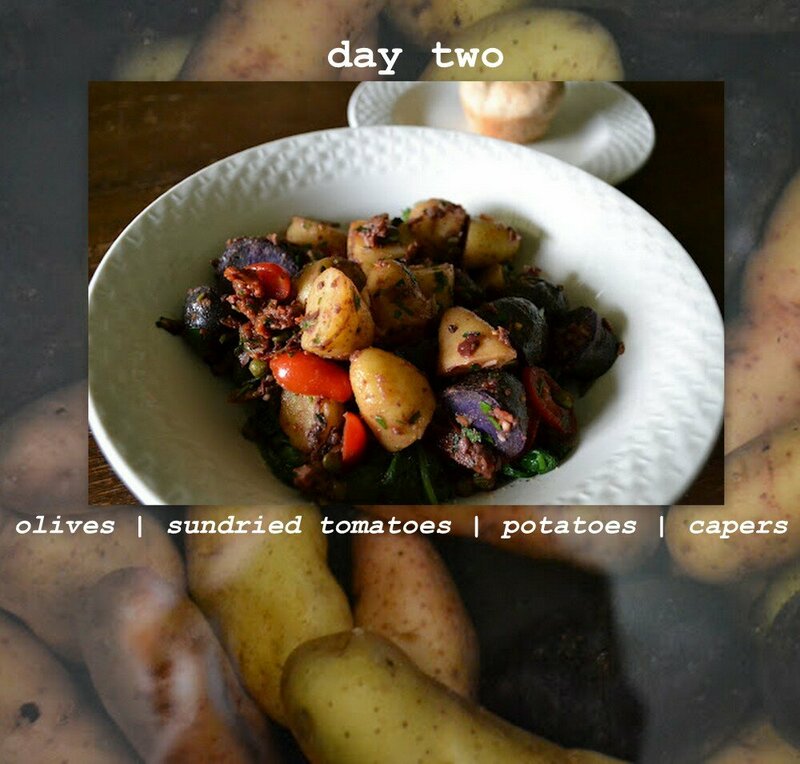 You had me at sundried tomato and Capers…with potatoes this is a dream! Love it! I am going to make this with a good piece of grilled fish on the side! Yum!